Today is all about Easter. Well, Easter decorations. And that’s why I came up with this. 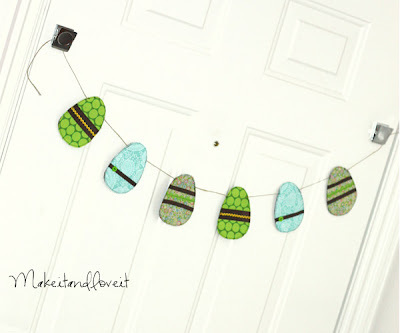 It’s like egg garland……hanging from your wall/door/furniture. It’s a quick project and involves minimal sewing. Make a template for your egg. Short stubby eggs, tall slender eggs, bumpy and lumpy eggs……..any type will do. Then cut out as many eggs as you’d like to string up on your wall/door/furniture. I made mine with 6, planning on draping mine on the door. However many eggs you cut out, cut that same number out in a plain color, as your backing. Then cut out that same number again of double sided fusing. Iron all 3 pieces together. Do this to all of your eggs. Now, decide how you want to decorate your eggs. Sew any decorations/embellishments onto your egg and then sew all the way around your egg. Stitch any ribbon into place. And then trim around the edges, cutting off the excess ribbon. (Heat seal any ends of ribbon with a lighter so that it doesn’t unravel.) Then make a seam all the way around the egg. 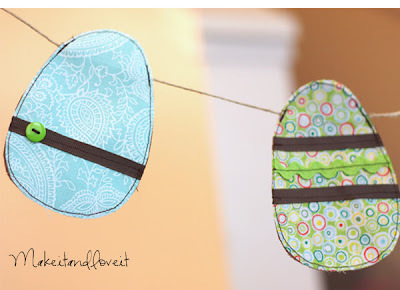 Attach your eggs to some twine/yarn/string along the side seams of the eggs. Then string up in your house somewhere. I will be stringing mine on my front door, on the outside. Well, once the snow-storms subside. But first, I will spray my eggs with Scotch Gaurd, just for a bit of added protection. And maybe with a ‘Happy Spring’ or ‘Happy Easter’ sign right there with it. What a cute idea! All this snow is not pulling me in a very springy mood: but maybe if I just do it, I’ll start felling it! Thanks for sharing all your cute ideas! So cute!! I just love Easter!! Oh man this is so CUTE! Love it! If only I had time to sit and sew/craft right now. Things will get back to normal in a few weeks, so maybe I will have to make it for next year! Thanks Ashley! I just found your blog via TipJunkie. I looked all the way back to the first post! Lots of ideas that I will be trying, and I will be back time and time again, I’m sure! LOVE this blog, Ashley. I am currently in the process of making those fabric blocks…and plan on making a tutu as well. :) Thanks for the ideas. It is SO beautiful here! I love this, I’ll be linking! This is cute! Thanks for the tutorial! You are a doll. I just love it all! My computer kept kicking me out of your blogs, so I am super happy to be back and see all the amazing things you have come up with. Did you see that clip on creativity they have on youtube from President Uchdorf? It makes me think of you. thanks for this simple but very great idea. plz send me the egg template..